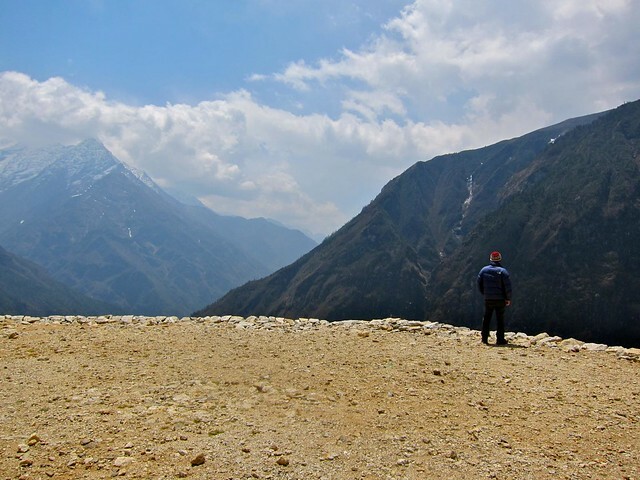 EBC Trek, Day 3: Rest day in Namche Bazaar – snackettes. Today, we awoke early (a side-effect of going to bed at 8:00 pm to escape the cold in our room, I guess), but we didn’t manage to pull ourselves out of our beds for at least another hour. My nose, which was the only part of my body outside of the sleeping bag, was cold to the touch, and the air in the room was freezing. Last night, Scott and I had the idea to pile all of our clothes that we were going to wear the next day on top of our sleeping bags, not only for extra warmth during the night, but also so that we could pull our freezing clothes into the sleeping bag with us in the morning and warm them up before putting them on. After we couldn’t wait any longer, we courageously grabbed our clothes, stuffed them into the sleeping bag for a few minutes (holy goosebumps!! ), and got dressed inside of our bags. After getting dressed, we tiptoed down the dorm hallway to the shared bathroom and turned on the trickle of freezing water from the sink. The water was too cold to splash on my face or even my whole hands, so I merely resorted to rubbing some soapy water between my fingertips and rubbing them onto my nose and forehead for my “shower”. A real shower would have to wait until midday, when it was warmer. Although our hike to Everest was scheduled to take 10 days, several of those days are scheduled to be “rest” days– not to fight off the inevitable fatigue and exhaustion that builds over the course of the hike, but to acclimatize slowly to the lack of oxygen in the air. Each day, we knew not to climb more than 300 net meters in altitude in a single day and to build in a rest day every third day. 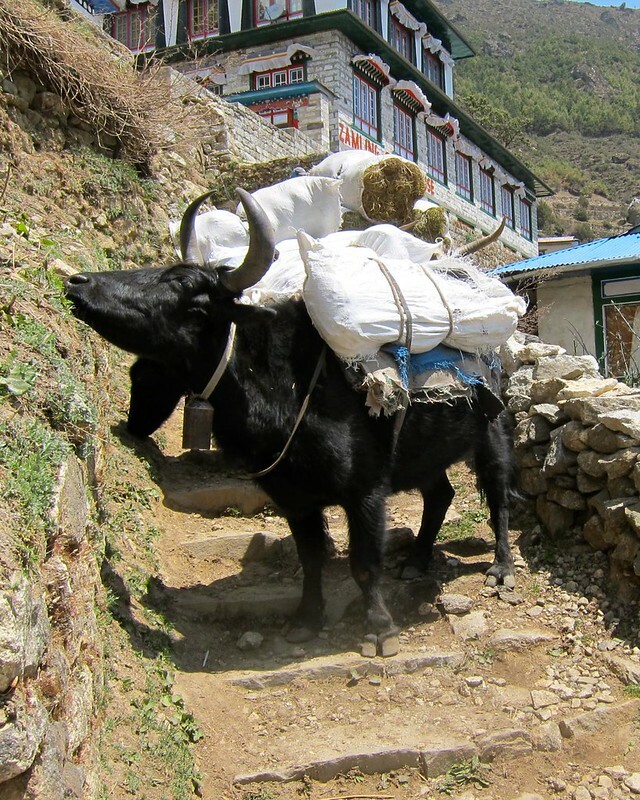 Therefore, all hikers (even experienced ones) use Namche Bazaar as their first rest day on the EBC trail. So we headed out the door and found that the town of Namche Bazaar was surprisingly quiet (save for the occasional yeti or yak…). We set out in search of some Nepalese breakfast and thankfully found some deliciously piping hot noodle soup at a woman’s shop down the street (we had developed a small obsession for hot noodle soups for breakfast in Thailand and Cambodia and were thrilled to find that the Nepalese also adhered to this amazing concept!!). 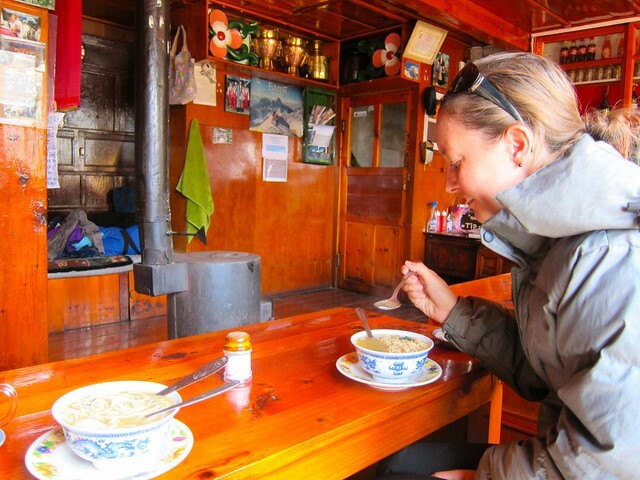 We ordered two different types of hot soups: one, a traditional Tibetan “thukpa” soup with wide noodles and vegetables in clear broth, and the other, a Nepalese ramen-style noodle soup out of a package. With the 30-degree temps barely creeping up outside (and no indoor heating…. ), both soups were hot, delicious, and very welcome. After breakfast, we decided to explore the outskirts of Namche Bazaar. 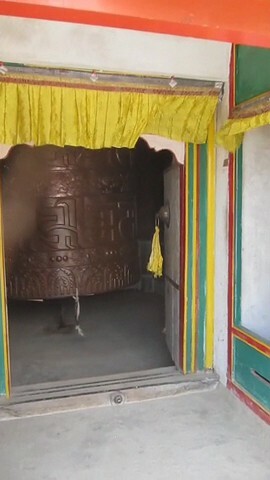 Up a small hill on the edge of town, we found some gargantuan mani wheels that rang each time they completed a circuit. Beautiful old murals and paintings on a canvas-like material adorned the walls around each of the wheels. 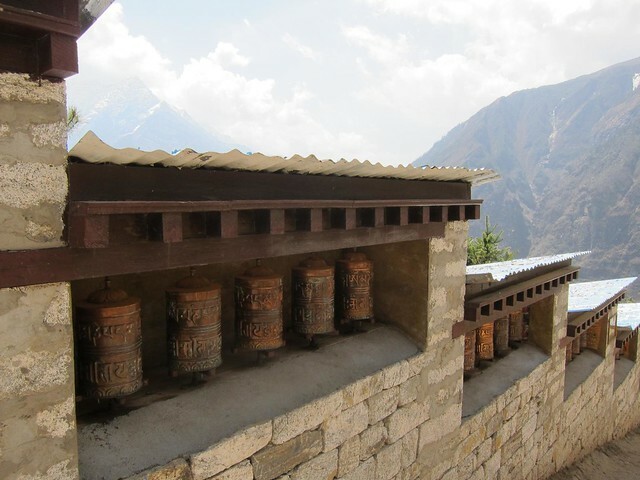 Smaller tin mani wheels lined the many paths leading to Namche. Eventually, we reached the edge of town, where the town quite literally fell off the map: an enormous cliff dropping to the valley below separated Namche Bazarre from the Himalayas in the distance. With the high altitude and near-360-degree views, our lookout felt almost heavenly. 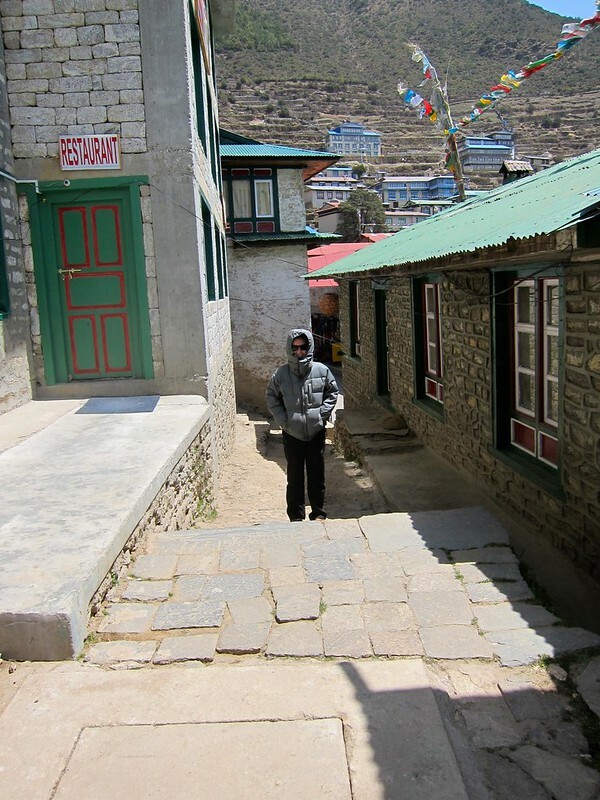 On our walk back to Namche, we came across a small monastery. Outside were signs in English, inviting us to come in. 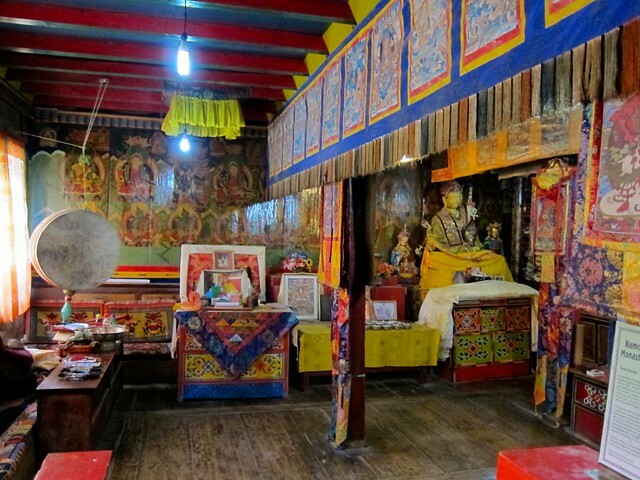 We tiptoed inside and were greeted by a Nepali monk dressed in dark maroon and saffron robes. 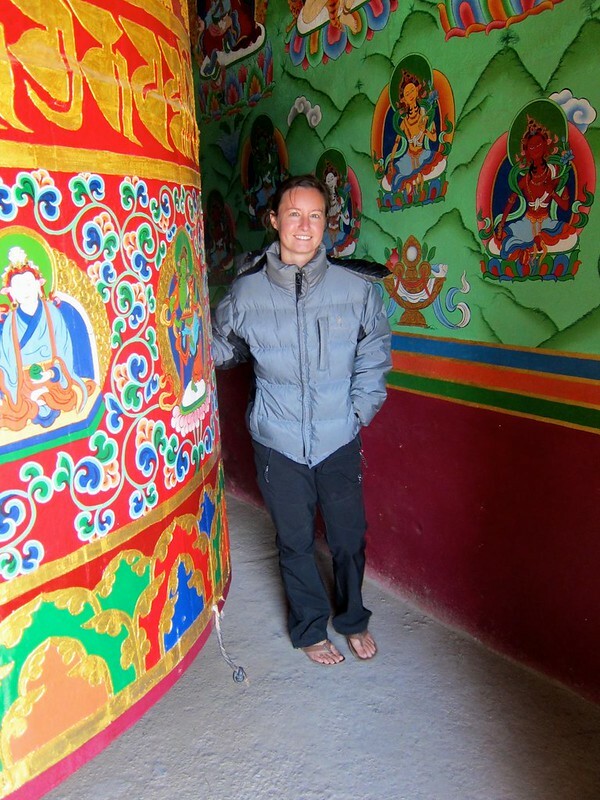 We couldn’t communicate with one another, but he beckoned for us to follow him inside the monastery, where dozens of yak butter candles lit the room. 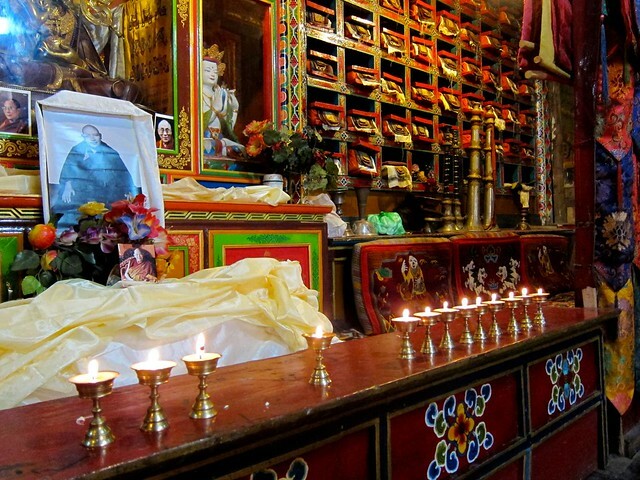 Surrounded by pictures of the Dalai Lama and other monks were small shoebox-like boxes in the cubbies of the walls. We had previously learned that these were old handwritten holy scrolls that had been copied and re-copied over the years, with each chapter being kept in a separate box. Noticing our interest, the monk pulled one down off the wall and showed us the pages. Each line had indeed been carefully inscribed onto the delicate translucent pages in black ink. I thanked the monk, pinched myself to make sure I wasn’t dreaming, and stepped back out into the twenty first century and on to Namche. Oh yeah, that’s ducktape (covering some gnarly blisters)– we weren’t hiking anywhere. So we spent the afternoon reading books and chatting to fellow hikers in a small German bakery where the apple streudels and warm drinks were more abundant than the oxygen outside. Life was good. That night, we hung out at Liquid Bar again, where we toasted our last comfortable day that we would get with a large Everest beer, while watching a documentary on Everest by the filmaker David Breshears. It was nice to have a rest day– and with the difficult hike tomorrow rapidly approaching, we were going to need it.